(BOSTON and CAMBRIDGE, Mass.) — Having achieved promising results in proof-of-concept prototyping and experimental testing, a soft robotic glove under development by soft wearable robotics expert Conor Walsh, Ph.D., and a team of engineers at the Wyss Institute for Biologically Inspired Engineering and Harvard John A. Paulson School of Engineering and Applied Sciences (SEAS) could some day help people suffering from loss of hand motor control to regain some of their daily independence. The majority of patients with partial or total loss of their hand motor abilities experience greatly reduced quality of life due to their inability to perform many normal activities of daily living. Tasks often taken for granted by the able-bodied, such as buttoning a shirt, picking up a telephone, or using cooking and eating utensils, become frustrating and nearly impossible feats due to reduced gripping strength and motor control in the hand. The stage is now set for that to change, however, thanks to soft, wearable robotic systems and the Wyss Institute’s “from bench to bedside” translational approach that has enabled the glove’s potential end users to be involved in every step of testing and development. The holistic approach ensures that technology development goes beyond achieving functionality to also incorporate social and psychological elements of design that promote translation and seamless adoption by its intended end users. “From the start of this project, we’ve focused on understanding the real-world challenges facing these patients by visiting them in their homes to perform research,” said Walsh, who is a Wyss Institute Core Faculty member, Founder of the Harvard Biodesign Lab, and Assistant Professor of Mechanical and Biomedical Engineering at SEAS. A team of undergraduate students also contributed to an early glove design as part of his ES227 Medical Device Design Course. Wyss Technology Development Fellow Panagiotis Polygerinos, Ph.D., and Wyss Mechanical Engineer Kevin Galloway, Ph.D. incorporated the patients’ feedback at every stage of development of the glove in an effort to maximize its potential for translation. Walsh’s team adapted the mechanics of the glove to make it more comfortable and natural feeling to wearers. 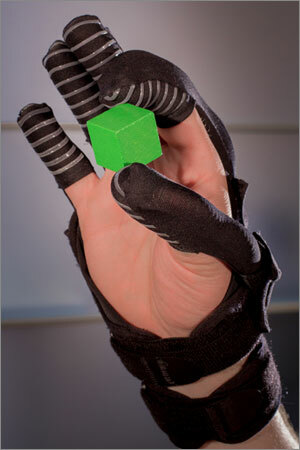 Over several iterations of design, the actuators powering the movements of the glove were made smaller and were modified to distribute forces more evenly over the wearer’s fingers and thumb. The resulting soft, multi-segment actuators, which are composite tubular constructions of Kevlar fibers and silicone elastomer, support the range of motions performed by biological fingers. The glove’s control system is portable and lightweight and can be worn using a waist belt or can be attached to a wheelchair. Now, the team is working to improve on their glove control strategies that will allow the system to detect the intent of the wearer. One potential solution is to leverage surface electromyography using small electrical sensors in a cuff worn around the patient’s forearm. The electromyography sensors – which could be used to directly control the glove – work by detecting the residual muscle signals fired by motor neurons when the patient attempts to perform a grasping motion. For patients suffering from muscular dystrophy, amyotrophic lateral sclerosis (ALS), and incomplete spinal cord injury, the soft robotic glove could allow them to regain some of their daily independence through robotic glove-assisted hand functions. Walsh and his team have also been aided in their work through key expertise from two other Wyss Core Faculty members – George Whitesides, Ph.D., who is also the Woodford L. and Ann A. Flowers University Professor at Harvard, and Robert Wood, Ph.D., who is also the Charles River Professor of Engineering and Applied Sciences at SEAS. The design of the glove has been published in Robotics and Autonomous Systems journal and the team also recently presented it at the International Conference on Robotics and Automation. This August, the team’s electromyography control work will be presented at the International Conference on Robotics Research, which is being held in Singapore. Down the road, the team is interested in developing the glove beyond an assistive device to a rehabilitation tool for various hand pathologies, and also in extending the glove’s assistive functions beyond the joints in the hand towards the development of soft robotic systems that aid impaired elbow and shoulder movements as well. The Wyss Institute for Biologically Inspired Engineering at Harvard University (http://wyss.harvard.edu) uses Nature’s design principles to develop bioinspired materials and devices that will transform medicine and create a more sustainable world. Wyss researchers are developing innovative new engineering solutions for healthcare, energy, architecture, robotics, and manufacturing that are translated into commercial products and therapies through collaborations with clinical investigators, corporate alliances, and formation of new startups. The Wyss Institute creates transformative technological breakthroughs by engaging in high risk research, and crosses disciplinary and institutional barriers, working as an alliance that includes Harvard’s Schools of Medicine, Engineering, Arts & Sciences and Design, and in partnership with Beth Israel Deaconess Medical Center, Brigham and Women’s Hospital, Boston Children’s Hospital, Dana-Farber Cancer Institute, Massachusetts General Hospital, the University of Massachusetts Medical School, Spaulding Rehabilitation Hospital, Boston University, Tufts University, Charité – Universitätsmedizin Berlin, University of Zurich and Massachusetts Institute of Technology. The Harvard John A. Paulson School of Engineering and Applied Sciences serves as the connector and integrator of Harvard’s teaching and research efforts in engineering, applied sciences, and technology. Through collaboration with researchers from all parts of Harvard, other universities, and corporate and foundational partners, we bring discovery and innovation directly to bear on improving human life and society. For more information, visit http://seas.harvard.edu.